This new edition of a highly successful book is completely updated and revised to reflect the latest developments involving the transmission of digital information over wireless networks. Written by an industry expert with over 32 years in the field, the Wireless Data Handbook offers a broad, unbiased treatment-unencumbered by various corporate interests-covering both the technical and business aspects of wireless technologies. 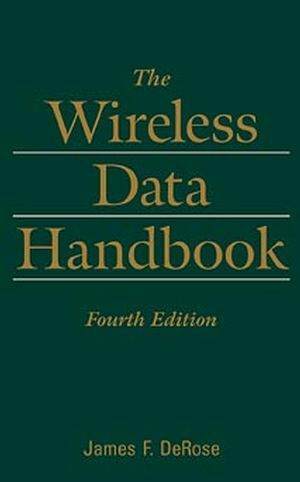 James F. DeRose, a Sloan Fellow, Stanford Business School graduate, and thirty-two-year IBM veteran, is the author of the Wireless Data Handbook, Fourth Edition (Wiley). A Short History of Data Radio. Public Terrestrial Packet Switched Networks. Public Terrestrial Circuit Switched Networks. BUSINESS 101: PRICE AND QUANTITY FIXATIONS. Fitting Applications to Public Offerings. Subscriber Growth: History and Barriers. BUSINESS 102: OTHER THINGS ARE IMPORTANT TOO. Estimating Airlink Capacity: Packet Systems.